My day one impressions of Iokath were pretty positive, but it only took until day two for the first storm clouds to appear. "I hate this stupid planet and these stupid quests," my pet tank announced while we were doing the dailies. "Oh, come on," I retorted, "I thought we had a pretty good time yesterday. I even wrote a blog post about how fun it was! Are you calling me a liar?" "Yes. Yes, I am." I thought he was overreacting for sure, but I certainly wasn't blind to the things that annoyed him. Eric mentioned on the forums that Bioware wanted to try something different with the Iokath dailies, and at this point I'm hesitant to call the experiment a success. At the very least it will probably need some iteration. Most daily zones are square or vaguely round-ish, so that you can literally "do the rounds" around the map while clearing out your quest log. Even as someone who's not a huge fan of daily quests, I'll acknowledge that there can be something pretty zen about that. Iokath's map on the other hand is kind of elongated, and what's worse, its quests are not evenly spread out across the map. Instead they mostly seem to have you going from one far end to the other while sticking to the very edges of one side. It's awkward, and exacerbated by the terrain being confusing, with multiple levels and various trams and teleporters strewn across the landscape without clear indicators of where they take you. The quest markers don't deal with this very well either and are often confusing or simply incomplete, leaving you to wonder just where you are supposed to do a certain thing. I appreciate that some of this will get better with time and increasing familiarity with the environment, but it's worth noting just how unintuitive this zone is to navigate at first. I have to admit I immediately felt affronted when I saw that the Iokath weekly mission requires you to complete ten daily quests when you don't get more than five a day. SWTOR's dailies have always been the pinnacle of casual friendly, with the main reward being gated behind a weekly that only required you to basically do the daily quests once per week. And now you are asking me to do two days a week? I'll admit that my initial reaction was over the top though. Two rounds of dailies a week is still pretty chill. Also, according to one of my guildies, the Iokath dailies seem to reset at a different time of day than everything else, or possibly even multiple times per day. Still need confirmation on that. For the first time in SWTOR history, you also don't get the same few dailies every day, but instead receive five out of a larger set that is either rotating or randomised (not sure yet). This is something that other MMOs have done for years and something I'm actually happy with, as it means that no two days are exactly the same. I haven't tested it, but log space permitting, you might also be able to gather up several days worth of dailies and then just do them all at once if you like. Conveniently, they auto-complete as soon as you fulfilled your last objective and you don't need to go back to base to hand in. This part sounds good, right? 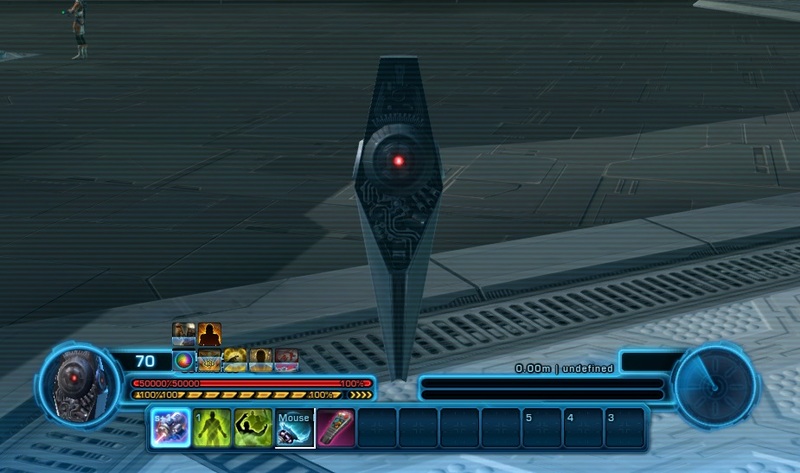 On Iokath, dailies actually cost you money instead of awarding it, at least some of them. There are several daily missions that require you to purchase a special temporary vehicle mount to complete the quest - and said vehicle actually costs more credits and shards (the area's special currency) than you earn for completing the mission, which is just bizarre. I only got one of these on my first day, but it was very strange to realise that while doing the initial storyline and the other four dailies, I had not earned enough shards to actually do the fifth daily. Was I supposed to just grind mobs in order to unlock the ability to do a daily mission? In what kind of world does that make sense? To add insult to injury, the vehicles are single use and buying one does not guarantee quest completion. When I had finally accumulated enough shards on day two, I bought an "Iokath Monitor" and went out to kill ten mobs with it as required by the quest. Unfortunately, I failed to realise just how low its health was and how squishy it was, which meant that it died right on the first group of three weak mobs I ran into. My quest was only on 2 out of 10 kills by then, so I had to gather shards for another two days to be able to try again. Seriously, who thought that this was a good idea? I get that they probably don't want everyone to be running around in vehicles all the time for PvP balance reasons, but the current setup is just a mess. I can't help but wonder whether the vehicle dailies were a hurried last-minute addition, as the notion of using walkers was originally just advertised as a feature of open world PvP. For that, limiting access to them makes sense, but it's nonsensical in the context of using them for daily quests. I also can't help but wonder whether maybe they messed up the drop rates of shards and reputation items somehow, because while gathering enough shards to buy even one vehicle is hard work, for some reason reputation tokens fall from the sky like rain. Two days in, I had already hit my weekly reputation cap with both factions. They'll really need to have another look at all of this. It's a shame too, because looked at in isolation, many of the new dailies have quite interesting and fun mechanics. The systems surrounding them just make you want to not even try. This is actually technically the third time Dailies have been on a rotational basis, although the first time is tied to a one-week rotation rather than a Daily rotation and the other was questioningly unintentional. The GSI Missions were temporarily 'broken' (it is unclear whether or not this was actually intentional) in 5.0 so that instead of all the missions showing up only a random selection of missions from the Planets showed up, such that in order to complete the Weekly you'd need to do all four planets rather than just the one (which is what makes me think it was actually intentional). Also, the exchange rate for Crafting Materials is rather ridiculous. It's a 12:1 ratio, which is really quite... silly. I've actually not even looked at the Makeb weekly since they updated it. Doing the achievements for that decoration pre-4.0 had me doing enough Makeb dailies for a lifetime (from my point of view). I didn't even mention the thing with the crafting materials, because as you said, the conversion rate is silly. Maybe something to do once if you really, really can't wait to buy a vehicle that day, but not really a sensible alternative to the silly shard grind. Yeah, if anything this is another case where simplifaction makes things much more tedious. The original Staged Weekly was a tedious experiment in of itself which I hope we never see again, but you could at least choose to ignore really tedious quests (the ones where you have to travel around the Mining Mesa scanning the drills and retrieve Speeders from the junkyards still leave painful memories) and take a more forgiving mission in its place. Now you can't ignore them. If they come up in that particular week's set of six missions, tough luck, you have to do them anyway or else you can't complete the Weekly. Whilst there was never much incentive to do the Weekly numerous times until that Decoration (which is gorgeous, I'll give it that!) came along, there's almost certainly no incentive to do it now. 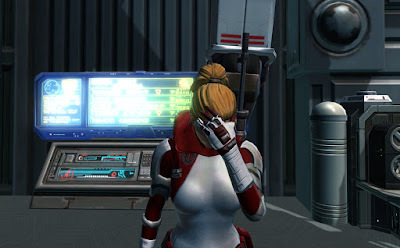 In some ways that tedious-mission situation has been 'fixed' in Iokath's Dailies; if there's a particularly tedious mission in that day's set, no bother, just leave it out and wait for the next day's to see what you get, and you'll still be making progress on that week's Weekly mission. It's definitely more tedious to have to wait a day in this regard rather than immediately picking a sufficient replacement, I will admit, but I'll take any lenience which I can get. Also, confirmation that Iokath Dailies do reset multiple times per day. I completed Fortifying the Defenses, Scrubbing Out the Scour Droids, Monitoring the Situation, and Disarm yesterday, while ignoring Detect and Destroy; when I visited the Daily Terminal just prior to the reset today I found Clearing the Path and Scouting Iokath on the terminal alongside the forgotten Detect and Destroy. But did they reset again after the "normal" reset time? I picked up a set this morning without doing it and tried again in the afternoon but nothing new had appeared. I think they may just reset once a day after all but apparently at a different time than everything else (midnight?). I checked again after the rest, and they updated to include two of the missions I did yesterday (Disarm and Fortifying the Defenses), implying that the game had previously tried to give me these missions which I was ineligible for at the time. I'll keep an eye out for further developments, though. I've been in the mood to rustle jimmies today, so I'm going to say that the theory behind the costs for some dailies is not unsound (that this game needs more credit sinks, and that the vehicle dailies are "optional"), but if that was the point, then they need better non-credit rewards behind them, and the acquisition rate of crystals needs to be higher. It was a swing and a miss. There's, what, 1 fixed (kill 50 droids) every day so far that I've seen, and 2 more that are solo/free. The last two slots include at least one "premium" mission and may or may not include the "group to kill the droid" one. I'm pretty sure the weekly is NOT supposed to be done in 2 days without maximum effort.